One of our designers, Evan Cihak, was recently inspired after watching a demo of a 3D design software. 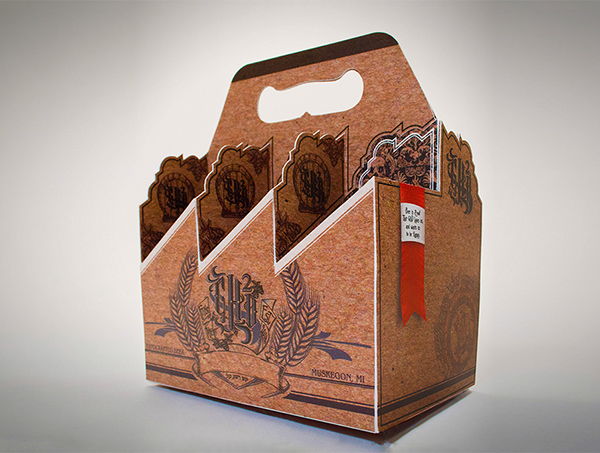 After the demo, Evan was sent a 6 pack template and was determined to develop it. The result is a stunning work of art! View the project and Evan's thoughts below. To learn how United Sign could help you with custom design projects contact us today through a phone call, 800.821.6530, submit a Quote Request or Email us and we'll be happy to help! Gh2o is a fictional Micro brewery created to display the capability of UnitedSign, a Michigan company, to create unique one off products for small market brewers. The name of the brewery is a play on the name Graphics House, the parent company to UnitedSign, and the design of the logo is a typography/gothic take on the chemical designation for water. 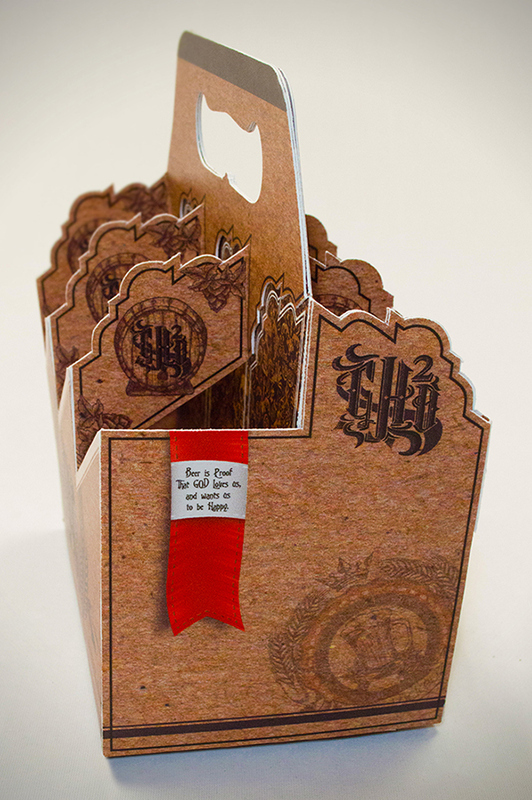 The overall design is intended to evoke the feeling of a hand drawn early 20th century advertisement. Numerous versions were created in order to come to the final design. 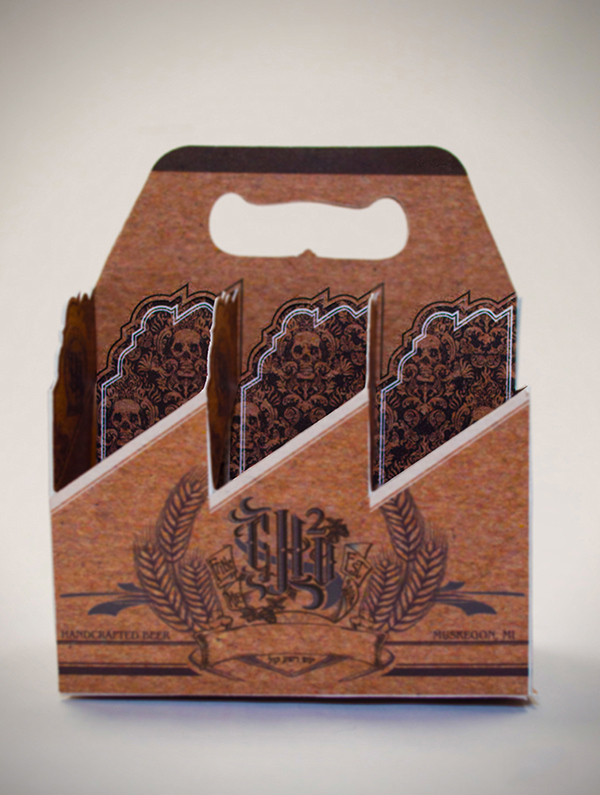 This decorative six-pack beer case is made of one piece of cardboard- cunningly cut, folded, and printed to make a deep 3 dimensional foreground and background to best show off the unique micro-brews it is intended for. 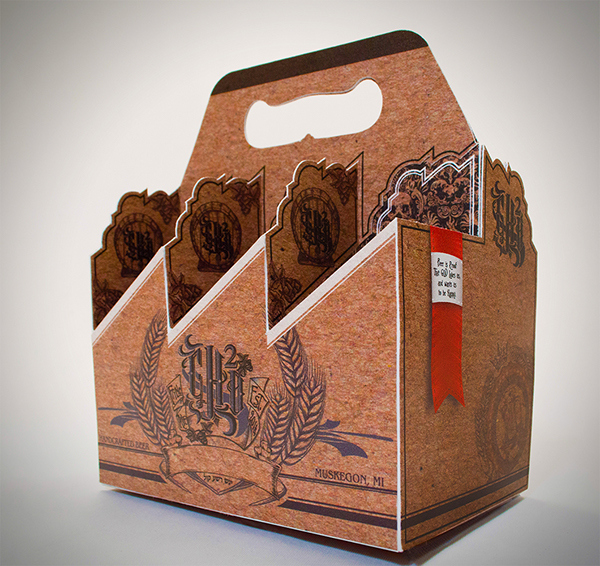 Numerous Design elements were included to fill out the case, adding both depth and richness to the artwork. Multiple overlapping layers were used to frame the bottles and provide something beautiful from any angle. Even the finger hole was designed with an ergonomic feel, and the comfort of the hand in mind. Even the filler piece used to separate the bottles and lend the case rigidity was given the design treatment. As the backdrop for the bottles, I felt it was important to use art that was interesting but not overwhelming. I settled on a damask pattern because it lends an organic elegence that fills without being overly demanding to the eye.